iTool WMA MP3 Converter for MAC supports converting batches of audio formats MP3, AAC, WMA from one to another directly. The conversion is direct and not through sound card so you can get perfect copies of the originals. iTool WMA MP3 Converter for MAC adopts advanced LAME Encoder, allows you to generate various sizes and qualities of MP3, AAC, WMA files. It offers rich options for your special requirements, support MP3 VBR, and AAC VBR. ...... It offers rich options for your special requirements, support MP3 VBR, and AAC VBR. With iTool WMA MP3 Converter's cute and easy-to-use interface, Just a few clicks to convert audio! 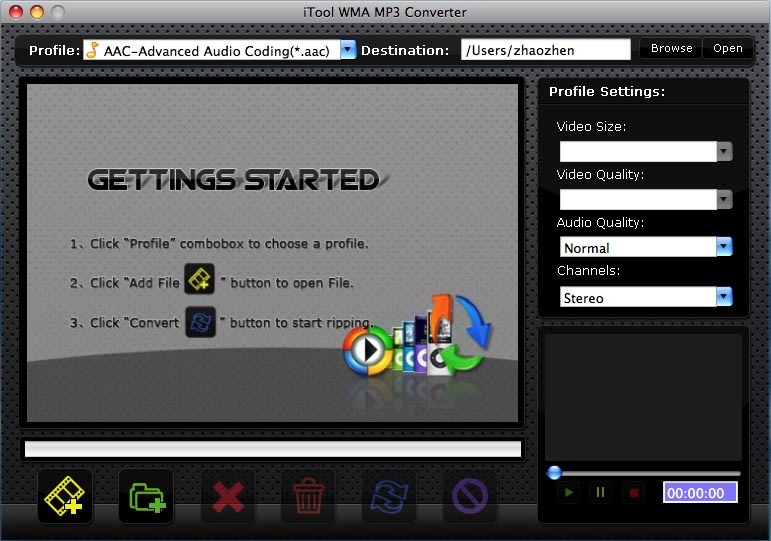 Free Download iTool WMA MP3 Converter For MAC to have a wonderful experience now! Qweas is providing links to iTool WMA MP3 Converter for MAC 2.00 as a courtesy, and makes no representations regarding iTool WMA MP3 Converter for MAC or any other applications or any information related thereto. Any questions, complaints or claims regarding this application iTool WMA MP3 Converter for MAC 2.00 must be directed to the appropriate software vendor. You may click the publisher link of iTool WMA MP3 Converter for MAC on the top of this page to get more details about the vendor.